The days after Christmas are always filled with delicious foods, and oftentimes, with self-recriminations over eating all those delicious foods (not that I speak from personal experience or anything). So I developed this recipe to be a) delicious and b) healthy! 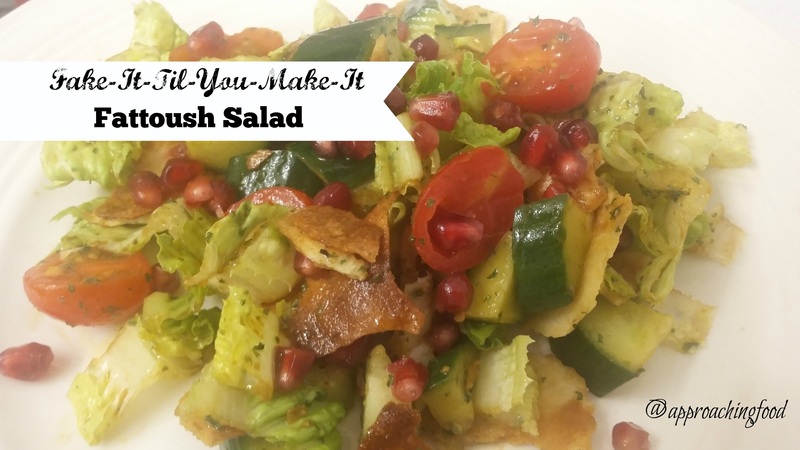 And I made it using only what I had in the house, hence the name: Fake-It-Til-You-Make-It Fattoush Salad! My dad, who is of Mediterranean origin, will shake his head if he reads this post, because fattoush usually contains some dried sumac as a seasoning. Do I have it in the house? No! Am I the Queen of Substitutions? Yes! So I just mixed up a dressing that seemed vaguely Mediterranean-ish (heavy on the olive oil and garlic), sprinkled on some pomegranate seeds, and called it good. The DH called it delicious! 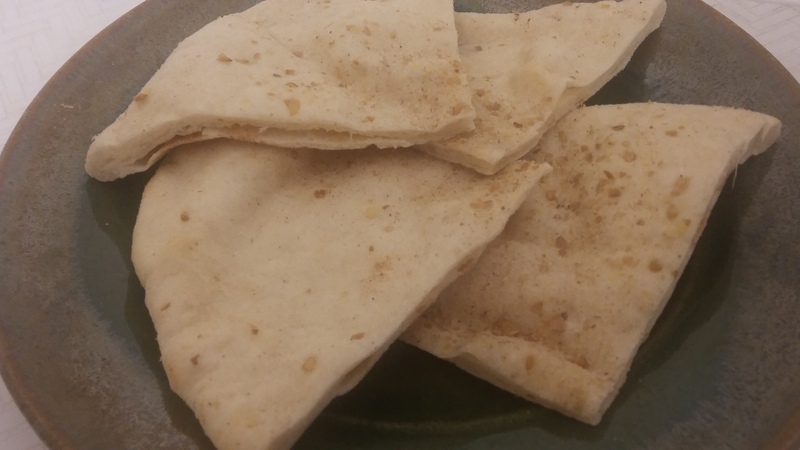 Split pita in half, spread 1 tbsp. oil on each half, and toast in oven on high heat until it starts to get crispy. Let cool, and break into bite-sized pieces. In a bowl, mix the vegetables together, add in the pita pieces, pour the dressing over it all, and toss to mix. Plate immediately, and drizzle with more olive oil. But…didn’t I write something about a nutrition profile in the title of this post? Indeed I did! While salad for a meal is in and of itself healthy, why not bump up the nutrition level? Which is exactly what I did! I used blackstrap molasses in the dressing instead of regular molasses, because it’s higher in iron and lower in sugar. Plus, when I was making the pita breads, I sprinkled either side of the pita with freshly ground flax seeds (omega fatty acids, baby!) as well as ground psyllium husk (up with fibre!). Ideally, the pita would have been whole wheat, but again, I was working with what I had in the house. Next Post: Those peppermint chocolate candy cane cupcakes that I mentioned last time! Probably. Unless I make some chocolate whoopie pies with peppermint buttercream. Hmm. Any strong feelings either way? Let me know in the comments! Linking Up at Meal Plan Monday! And at Clever Chicks Blog Hop! This entry was posted in Breads, Salads I Have Known and Loved, Vegetarian Main Dishes on December 27, 2016 by Margaret. So good there were only a few left to photograph. But it was all quality control, I tell you! I sometimes wonder whether I put the word ‘easy’ in front of too many of my recipes. But the thing is…they really ARE easy! Except for today’s recipe, which EXTRA-SUPER-DUPER easy! Also extra-super-duper yummy! What is this easy and delicious treat, you ask? Christmas-themed Peppermint Patties! The patties themselves are made up of only 3 ingredients, and if you want to dip them in chocolate, well, that’s just one ingredient more. How to make this 4-ingredient candy? That is no-bake and so easy that a child could make these patties? Read on, dear readers! Make the ‘dough’: mix the icing sugar with the melted and cooled butter and the peppermint extract. It will slowly form a ball of ‘dough’. Roll out the peppermint dough on a cool surface dusted with icing sugar. Use cookie cutters to cut out shapes and place these shapes on a cookie tray lined with parchment paper. Place in freezer to firm up and get really cold. Meanwhile, melt the chocolate wafers in a microwave-proof mug in…you guessed it, the microwave. Use 30 second bursts to check and see if it is melted yet. When it is almost all melted, take it out and stir it with a spoon until fully melted. Using a fork, place the now frozen peppermint patty on the fork, and dip into the melted chocolate. Lift out of the chocolate, tap the fork on the edge of the cup to get off any excess, and place back on the parchment paper lined cookie tray. Repeat for all peppermint patties, and return sheet to freezer to set up the chocolate. To decorate the tree, melt some white chocolate melts in a plastic bag in the microwave (a strong plastic bag, as a thin one will melt), snip off the end, and pipe a back and forth design on the peppermint patty. While still wet, sprinkle with multi-coloured ball sprinkles. Return to freezer to set-up. And…you’re done! Give to family and friends and place on holiday cookie trays, and revel in the praise that will come your way when they bite into it (“Omg, so perfectly melty!” It really does melt in my mouth!” You made these? No, really? Wow!”). Honestly, it’s seriously super-duper easy. If you don’t want to mess about with dipping them in chocolate, a 4-year-old could make these. Even if you’re not a baker or a cook, YOU could make these! Just don’t dip them in chocolate, and instead sprinkle crushed candy canes on top. Bam, you’ve made Christmas! Next Post: Chocolate Cupcakes with Candy-Cane Frosting, Two Ways. Because um, yum! Linking up at Meal Plan Monday! And also at Candy Plan Monday! Light, and crunchy, like little bites of summer freshness, these sprouts add healthiness to your salads and sandwiches. Or maybe sprinkle on top of some soup? Yes, I think that’s perfect! A bunch of fresh sprouts on top of a bowl of steaming soup, served with my favourite bread recipe. Wouldn’t that hit the spot right now? How to make them? Rinse them in water. Bam, done! 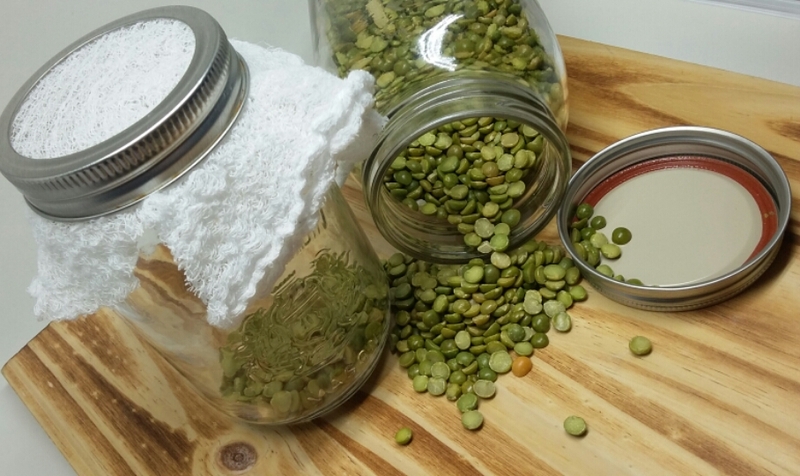 Place dried lentils in mason jar. Stretch cheesecloth over top and fasten in place with the canning jar ring (or an elastic). Add water until covered by an inch of water. Soak for 12 hours. Empty jar of water by turning upside down and draining water through cheesecloth. Turn right side up and leave for 12 hours. Then rinse (not soak) in water, drain water (immediately) again, and repeat rinsing and draining immediately every 12 hours or so. In a day you’ll see sprouts starting, and in 3-5 days, your sprouts will be ready to nom-nom-nom on! When you want them to stop growing, put the canning lid on them, and store in the fridge. They’ll keep for several days. This time with dried peas! This is a great project to do with kids, as they can see the sprouts growing with each watering. It really is super-easy! 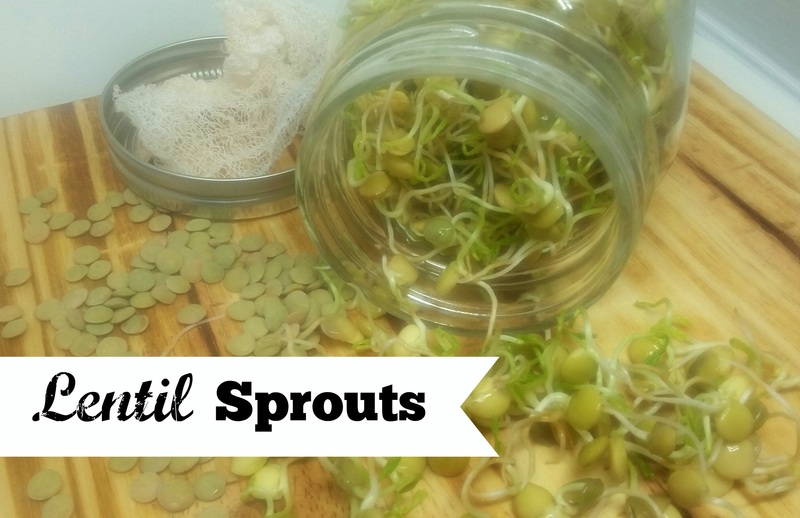 Be warned though, a tiny bit of dried lentils will produce a lot of sprouts! I learned this the first time I made some. I made a huge mason jar full, and after eating them with every meal for several days, I conceded sprouty fatigue, and gave the rest of the jar to a colleague. All this said…I must add a caveat emptor: if you grow your own sprouts and it is theoretically possible that they could grow bacteria. To quote the www.foodsafety.gov website, “Like any fresh produce that is consumed raw or lightly cooked, sprouts carry a risk of foodborne illness. Unlike other fresh produce, seeds and beans need warm and humid conditions to sprout and grow. These conditions are also ideal for the growth of bacteria, including Salmonella, Listeria, and E. coli.” So, be informed, and make your own judgement call. I’ve never gotten sick eating homegrown sprouts, and no one I know has gotten ill eating sprouts (homegrown or otherwise), but if you grow them and they look odd, toss them and try again. Better safe than sick, amirite? With that said, I totally suggest growing your own sprouts! Hey, you get to grow your own nutrients, and look all cool doing it (at least, I think it’s cool!) If you grow them, take a photo and tag me on my facebook page! I’d love to see the fruits (vegetables, actually) of your labour! Next Post: Peppermint Patties! Three ingredients, 3 minutes, 30 patties. Dip them in chocolate? Eat as is? Your choice! This entry was posted in Salads I Have Known and Loved, Snacks on December 7, 2016 by Margaret.